The rear wheel bag designed by use to suit what we actually need. There are a lot of bags on the market some great some not so good. Some that fall down and end up dragging on the road. Some that make accessories hard to travel with. Well we have designed our own rear wheel bag to meet what we actually need. Its most different feature is that it has a space cut out on the top so it can be mounted over a pair of Maxtrax or even a High Lift Jack. It has been reinforced to protect it from rubbing through on the rear. It has a very large bag size with 2 large pockets on the side. Its is made from a rip stop PVC There are drain holes in the bottom so you can wash the bag out. It covers and protects the spare wheel but incorporates a hood so the bag can not fall down or hang from the spare wheel. It is designed to fit over 33 and 35 inch tyres. We have been 4wding and Touring for years and years and have now designed our own Rear Wheel Bag incorporating what works for us and we are providing it for you as well. We are certain that this is the best Rear Wheel Bag designed. What are the benefits of carrying a rear wheel bag? There are many benefits of the Nuts Rear Wheel Bag. It features a huge rear bag area and 2 large deep side pockets with drain holes into the bottom so as it can be hosed out and completely washed through. The bag and pocket area is great for carrying any dirty recovery equipment or the rubbish from your campsite. People even use it to carry their recovery equipment to free up space inside the 4wd. This even makes recoveries a lot simpler as it gives easier access to the recovery gear. When you are stuck in some cases you can’t open doors to get out your gear so having it accessible in the Nuts Rear Wheel Bag makes it safer and easier. Why is our Rear Wheel Bag different? Our Nuts Rear Wheel Bag is different. It is made from a Rip Stop Vinyl and is double stitched to give it maximum strength but also has a cut out in the top and a reinforced back so it can be mounted over the top of 4wd accessories that may already be mounted on the spare wheel. This makes it the most different 4x4 Wheel Bag on the market. As well as possibly the most heavy duty. What are the main features of the Nuts Rear Wheel Bag? We designed a bag with a hood so that it kept the bag secure and stopped it from possibly falling down and being damaged or being dragged along the ground. We also wanted a hood so that it would also protect the spare tyre from sun damage but we wanted to be able to mount it on top of things like the Maxtrax or a High lift jack. So the cut out on the top of the bag does just that and it will fit on a 35 inch wheel with a set of 4 Maxtrax strapped onto the wheel itself. How do you turn your rear wheel space into an extra storage solution? We have developed the Nuts Rear Wheel Bag to be a simple fitment where it just slides over the top of the spare wheel and then an elastic strap is fitted through a loop on the top of the hood and clipped to the side loops which are sewn into the sides of the bag. Yes we actually supply the elastic strap so the bag comes complete and ready to be fitted. So it’s as easy as that to create extra space for your rubbish or dirty gear with the extra space this Storage Bag creates. Why did we develop our own Nuts Rear Wheel Bag ? The rear wheel bag has been around for a number of years now and during this time there have been a lot of different designs and shapes. Some work well others not so great with 4wders having them fall down and drag along the ground damaging them and losing their rubbish or gear without them knowing. We have not found a rear wheel bag that gives us exactly what we wanted. We here at Nutsabout4wd are 4wd Enthusiasts and we actually use the gear that is on the market. So instead of complaining about it we did exactly the opposite. We designed what we actually wanted and made them to bring to Australian Market. Why is having a 4WD rear wheel bag benefit the environment? It features a huge rear bag area and 2 large deep side pockets with drain holes into the bottom so as it can be hosed out and completely washed through. The bag and pocket area is great for carrying any dirty recovery equipment or the rubbish from your campsite. It can be used as a Rear Wheel Rubbish Bag to keep the country clean. What is the Storage Capacity of the 4wd Rear Wheel Bag? We have created a very large rear bag with a storage capacity of 60 litres as well as 2 side pockets which have a storage capacity of 8.4 litres each. How do you know if the Nuts Rear Wheel Bag will fit over your spare wheel? The sizing of the Nuts Rear Wheel Bag is currently made to suit a 33 to a 35 inch tyre or the metric equivalent and will fit over a 35 inch tyre with a set of 4 Maxtrax strapped to the wheel. We will endeavour to build a range of Nuts Rear Wheel Bags to suit other sizes in the future. This is genuinely a Car Tyre Rubbish Bag to fit over the rear wheel. 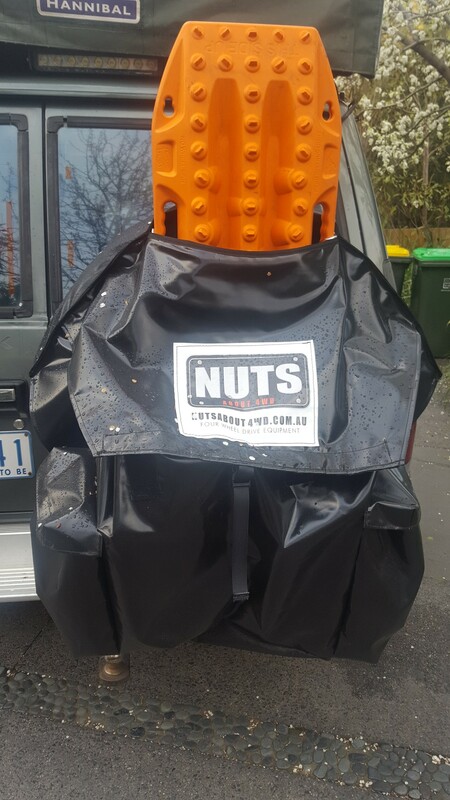 Why choose the Nuts About 4WD rear wheel bin bag? We know the bag works. Before we released it onto the market we tested it ourselves, made changes and retested it. We then sent it with a 4wd club, 4x4 Adventure Club, who do nothing in halves, to the Cape to see how it handled carrying constant weight over some of the best corrugations and tacks in Australia and it came back in one piece and was absolutely perfect. We have had customers on the brink of ordering from overseas the bag that they wanted until they saw our bag. It was also exactly what they wanted. It’s the sheer size of the bag and the easy of fitment options that makes this bag awesome was their words. They took the bag straight on a trip to the Big Red Bash in Birdsville and loved it. The Nuts Rear Wheel Bag should be the bag of choice for any exposed spare wheel. Our Bags are designed by ourselves, 4wder’s who were just not happy with what was currently out on the market so we designed it ourselves for what we actually need! 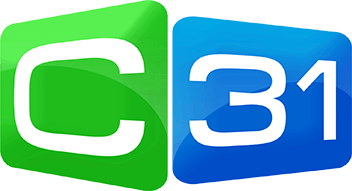 We believe them to be the best on the market and we know that because we use them! How easy are the Nuts Rear Wheel Bags to keep clean? We have designed the Nuts Rear Wheel Bag with eyelets in the bottom of all of the pockets. This makes it easy to be able to keep them clean. Simply hose them out and let them dry. Perfect to be used as a Dirty Gear Bag. If you have any questions or queries relating to a Nuts About 4WD product or service simply use the form to get in touch.